Any owner may, not later than the 15th day after the date of the meeting at which the election and/or the vote tally was held, require a recount of the votes. A demand for a recount must be submitted in writing either: (1) by certified mail, return receipt requested, or by delivery by the United States Postal Service with signature confirmation service to the Association’s mailing address as reflected on the latest management certificate filed under Section 209.004 of the Texas Property Code; or (2) or to the address to which ballots, proxy ballots, and absentee ballots are mailed. (B) a person agreed on by the association and the persons requesting the recount. Any recount under this Policy must be performed on or before the 30th day after the date of receipt of a request and payment for a recount in accordance with Subsections (b) and (c). If the recount changes the results of the election, the Association shall reimburse the requesting owner for the cost of the recount. 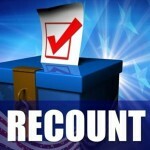 The Association shall provide the results of the recount to each owner who requested the recount. Any action taken by the board in the period between the initial election vote tally and the completion of the recount is not affected by any recount.